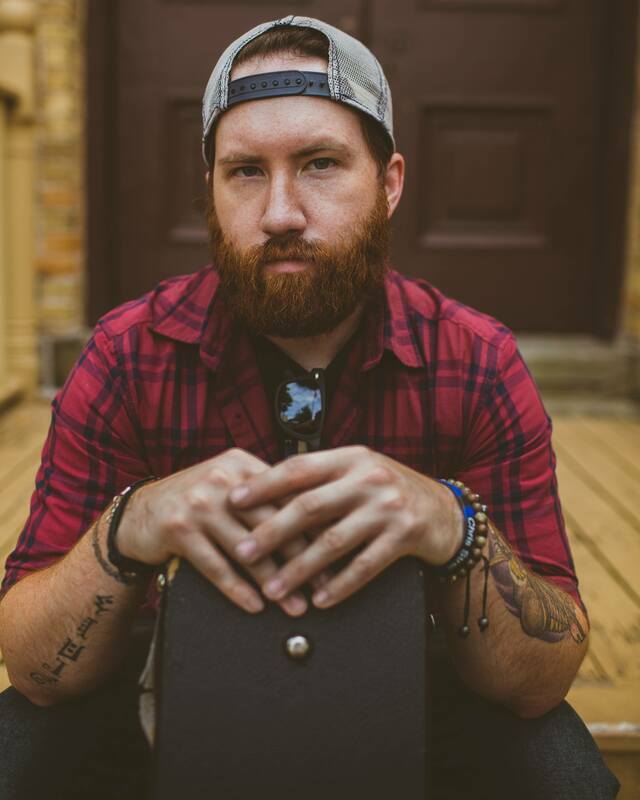 Chris Strei is a Canadian singer-songwriter from Southern Ontario, with a style compared to Chris Stapleton and Bob Dylan. Born in 1987 with no family roots or influence in the music industry, it's tough to say where his passion and musical nature comes from. It's just always been there. ​Butch Walker, Chris Stapleton, Johnny Cash and Tom Petty have molded Chris's style as a songwriter, while, but his love for music in general has always been the major influence on his writing style. Chris's musical compositions feature a mix of influences from bluegrass, blues, and hard rock/metal, which are a prominent element on songs featured on his 2019 album "Moonshine". ​Although Chris has been performing music since 2005, the story begins after a car crash in 2008, at the age of 20 years old, on Powerline Rd. in Brantford, Ontario. A crash that should have been fatal, but turned into a new beginning. During his recovery, Chris took the opportunity to hone his skills as a musician and songwriter, which doubled as motivation to recover quicker, and inspired the song "Back To You". After only 7 months, Chris' reconstructed leg, punctured lung, broken rib cage and sternum, and brain injury were merely speed bumps to him. In 2011, Chris graduated from Recording Arts Canada, Toronto Campus. He went on to write, record and produce his first album "Ever Will" in 2013. A follow up album, "Faces", was released with project called Minus Everything in 2014. Surviving that crash was a second chance that Chris refuses to waste. A second chance to make a serious go of a career in music. A decade later in 2018, Chris played his way through Ontario, Manitoba, Saskatchewan, and Alberta on his Blackbird Tour. A tour that was motivated after being turned down for a guitar player position on a national tour, due to his lack of touring experience. Chris has been blessed with the opportunities of being a special guest of Dayna Manning from Trent Severn in August 2018, and The Trews in December 2017. In June 2018, he made the top 10 of Brantford's Breath of Fresh Air, and the top 25 of The Shot in September of the same year. Chris has also taken part in Epidemic Music Group's Guinness World Record concert for longest running concert, NSAI's Tin Pan North, and has become an annual performer of Ingersoll's Canterbury Folk Festival. Chris has appeared as a solo artist on RogersTV in Guelph and Branford, BarberShop Podcast with Kevin Barber in Hamilton, and The Disability Channel with Jay Stoyan in Toronto, which led to him co-writing and performing the TDC theme song, "Shining Light" at Toronto's Hard Rock Cafe and Dundas Square in 2016. Early stages of the song were recorded at the home of Ronnie Hawkins, and composed, engineered and mixed by Silvio Simone. Although media appearances and radio play have always been a dream, Chris Strei is truly at home when he's performing on stage, and keeps close connection to his roots as a music fan by including a mix of his favourite artists in his repertoire. From John Denver's "Country Roads", ​Chris Stapleton's "Whiskey & You" and Jason Aldean's "Drowns The Whiskey", to Bruce Springsteen's "I'm On Fire", Johnny Cash's "Folsom Prison Blues", and Tom Petty's "I Won't Back Down". On May 1st 2017, Chris Strei released his self-titled EP on iTunes and Spotify. That summer, "Flowers & Drapery" achieved radio play on Montreal's CJIM and KA Radio's "From Texas and Beyond" in Scotland. Josh Wall filmed and directed a music video for "QEW", which appears on the EP as well. ​"Wrong" is the top streamed song from the EP on Spotify and will be re-released on the upcoming 2019 full-length album, "Moonshine" produced by Iain McNally and featuring Rick Roach on drums. ​Join Chris Strei's Mailing List!